1. Where is your project today? 2. What do others see in your project? 3. Where would you like your project to be? 4. What is your plan to getting there? TOPSIGHT: A VISION STATEMENT: explaining why you selected your FOCUS DOMAIN (i.e. : LEARN, SHARE, OPPORTUNITY) and how it is salient for LIFE2050 in PGH3.0. INSIGHT: EXPEDITIONARY TREK INSIGHTS: from observations and interviews in your neighborhood. FARSIGHT: 2013 WEAK SIGNALS/FUTURE SIGNS: drawn from your exploration of myriad CMU and Pittsburgh city and regional initiatives, organizations, plans, programs, labs, centers, startups, accelerators, incubators, etc. – introduced to you all throughout this semester. – GLOBAL BENCHMARK GOALS: relevant to your Focus Domain. These LONG HORIZON GOALS should be drawn from sources like WBCSD, IFTF, OECD, UN Millennial Goals, Green Denmark, NMC Horizon Reports, CSPC, GBN, FFF, IFF, Alternative Worlds Global Trends, The Singularity, etc., etc. (Go back and refresh your memory about all the references, especially from Days 2, 3 & 4). – 2050 LOCAL BENCHMARK GOALS: for your LOCUS NEIGHBORHOOD – with special emphasis on those LOCAL BENCHMARK GOALS that map onto and help advance GLOBAL BENCHMARK GOALS. SOCIAL DESIGN: GOOD?BAD?OR? A. Wasserman Orange Paper Social Design-Good?Bad? 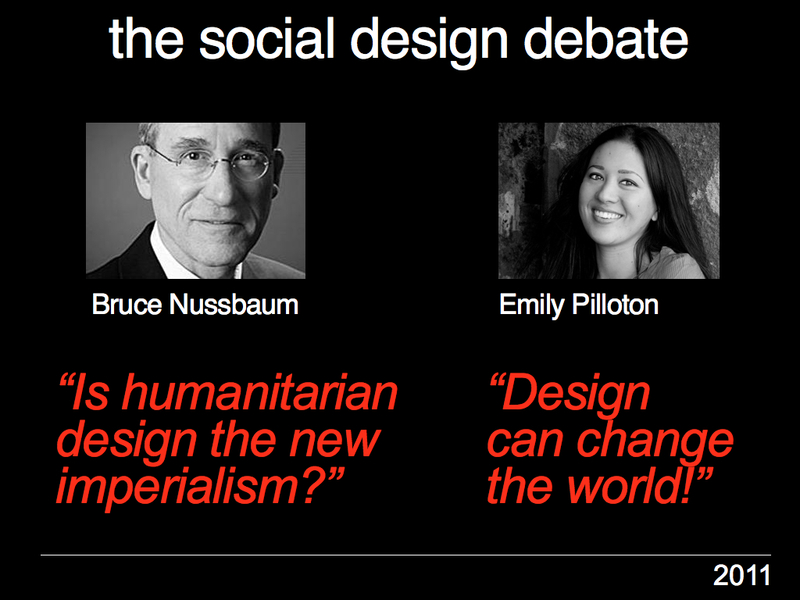 Humanitarian Design: The New Imperialism? TECH PHILANTHROPY Northern California is at the forefront of a new wave of global philanthropy aimed at providing technological assistance to developing countries. Michael Krasny of KQED talks to some local technology philanthropists about their work.